ASAP will hold general events, exhibitions, and special interest programming throughout the year. 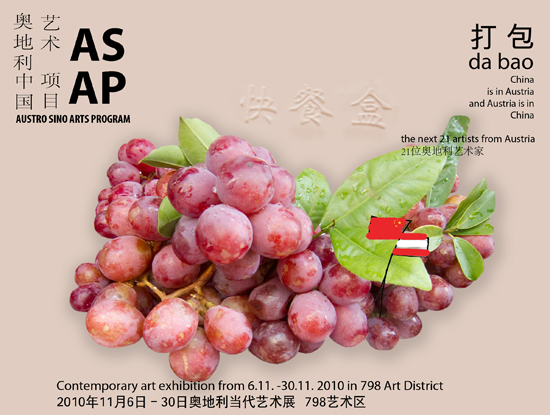 • Showcasing recent China-produced works by Austrian artists in China. • Creating an multimedia arts archive of past artistic creations by Austrian artists in China. • Providing resources for interested international and local academics, students the general public in China, as well as incoming Austrian artists. • Producing on-going Austrian AIR China Programming. • Holding lectures and workshops . ASAP’s international advisory board consists of representatives from organizational partners, legal and finance professionals, and cultural ambassadors. The steering committee is made up of ASAP’s founding members and is responsible for the development of ASAP’s mission, goals, and objectives, as well as initial evaluation of program progress. The Austrian government has six years of formal investment in Austro-Sino arts initiatives conducted in China. The full impact of these developments have yet to be presented to the public in an accessible format. ASAP is an artist founded, artist run, not-for-profit, proactive organization. The founding members are Austrian artists with extensive experience in program management, events coordinating, Chinese culture, and Austrian contemporary art, with backgrounds in multiple art mediums. Passionate about arts programming and community networking, ASAP’s founding members believe in the importance of intercultural arts dialogue and cooperation. The mission of ASAP is to raise awareness about contemporary Austrian-Sino creative achievements in China by both Austrian and Chinese artists.